Wir (5-köpfige Familie) haben den Aufenthalt in Audreys Appartement sehr genossen. Die Wohnung ist gross und sehr gut eingerichtet. Es fehlt einem an nichts! Die Fotos auf der Website entsprechen dem, war wir vorgefunden haben. Audrey ist zudem sehr hilfsbereit, nett und zuverlässig. Alles hat tiptop funktioniert und sie hat sogar organisiert, dass wir mit dem Taxi am Flughafen abgeholt wurden. Gerne wieder! Nice, large apartment, short way to city center and for purchasing. About 50m to the sea (rocks) and a few steps more to the city beach. Good equipment but not very high quality (kitchen/bed). We spent 10 days in the apartment and we had a great time in Otranto! The apartment is located next to the rocky beach where is access to the sea and where you can find also a challenging high rock where our boys loved to jump into the water. The water is clean and full of interesting marine life. Short walking distance is sandy beach with shallow water. The beautiful historical town Otranto is full of restaurants, cafeteterias, gelaterias etc. The apartment is very spacious, clean, nicely decorated and in fact it looks even better than on the pictures! Finally, we would like to thank Audrey, she was a wonderful and caring host and we have enjoyed every moment of our stay there! We rented Audrey and Davide's apartment for 2 weeks during the high season in August and despite it being the peak tourist season we found the apartment and location to be ideal for our summer vacation. We could walk barefoot from the apartment to the rocky seafront at 8am and throw ourselves into cristal clear water for a morning swim along the beautiful coast! 5min away there was access to a sandy beach and beautiul shallow lagoon which was perfect for our 15 months old daughter to swim/enjoy herself in. She even learned how to walk there. The apartement was relatively cool despite hot temperatures and every room was equipped with a fan. 5min walking distance away there is a great little bar with a beautiful view and the old town in which we loved to enjoy morning coffees and fresh croissants. They also served delicious local sandwiches and drinks. The neighbourhood is quiet, there is a perfect parking spot just in front and we even made friends with some of the lovely neighbours. The apartment is clean and pleasant! We hope to be able to come again! Das Appartment ist geräumig, sauber und ausgestattet mit allem, was man braucht. In wenigen Schritten hat man das Meer erreicht, und bald auch den Strand. Mit Kindern kann man das flache Wasser genießen, auch Schwimmer kommen auf ihre Kosten. Mit großer Hilfsbereitschaft stand die Vermieterin bereit, um Rat zu geben. Otranto ist eine wunderschöne Stadt mit viel Ambiente und vielfältigen Gelegenheiten zu kulinarischen Genüssen. Wir können das Apartment wärmstens empfehlen! 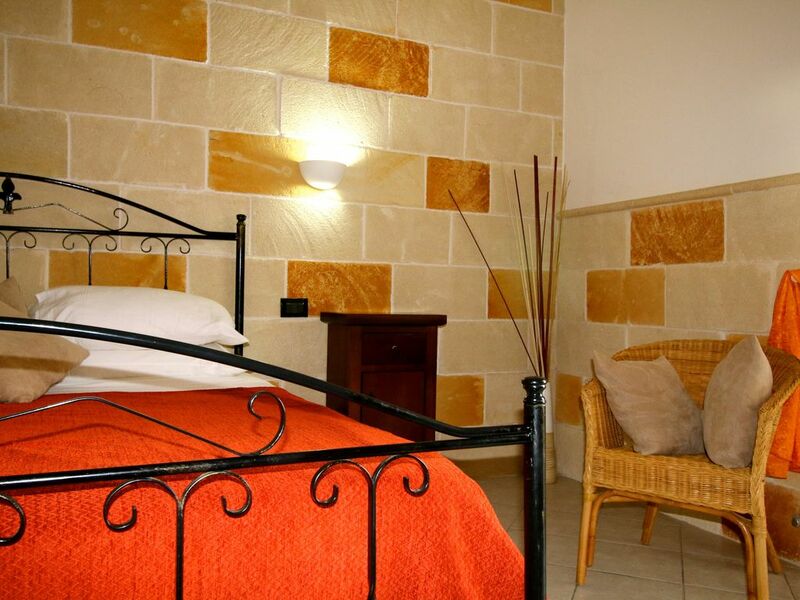 The apartment is very clean, well maintained and equipped. Audrey was very helpful in getting us settled and orientated, and was nearby if needed. Location is excellent - there is a nice beach less than five minutes walk away, and the old town + wonderful beaches are about a five minute walk along the front. The neighbourhood is quiet and residential, with two decent supermarkets nearby. The apartment is very well suited for young families. It is on the ground floor and there are no steps, so ideal if you have a buggy. Audrey provided a really good quality travel cot and high chair - our four month old slept better than he does at home. Only other points to note is that one of the bedrooms is at the other side of the apartment to the main two bedrooms, so you will not hear any waking baby in the night (could be a good thing) unless you have a baby monitor. And the floors are hard tile throughout so you may need to take that into account with crawlers / toddlers. The nearby beaches are ideal for kids - lovely sand and shallow warm water. Flexible arrival/departure days during our rental season. There is parking for one car in the private cul-de-sac area( if you are travelling with two cars please enquire). Confirmation deposit is needed as soon as possible to secure the property which is 50% of the total rental cost . In case of any breakages €100 caution is due upon arrival which will be returned on departure day after the apartment has been checked by the owners.